Profile the performance of your game. 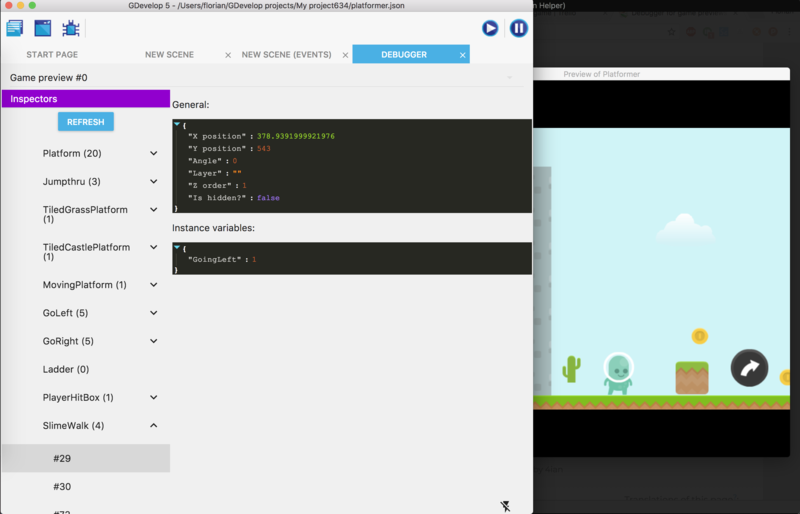 The debugger is a tool that lets you inspect the content of your game. 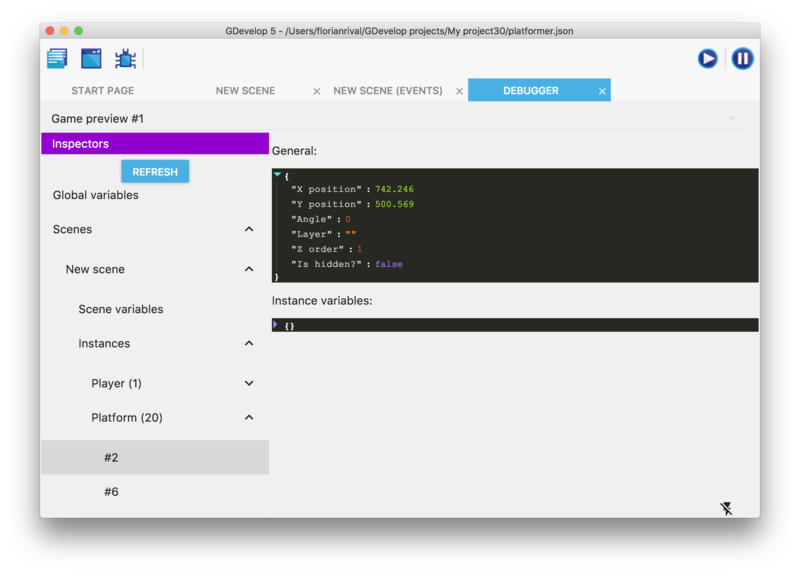 In particular, you can inspect the global variables, scene variables and variables of instances of your objects. It is a powerful tool. You can pause the game at any time. Using the Debugger is a great way to understand why something is not working as intended or to do quick tests in the game. The profiler is a tool that measures the time spent in different parts of the engine while your game is running. It helps to find bottlenecks or events that could take a lot of resources in your game. Read more about using the profiler here! This is an advanced feature of GDevelop. If you use it, we would like you to show your support for GDevelop by getting a subscription! In the menu, choose “Preview with debugger and performance profiler”. 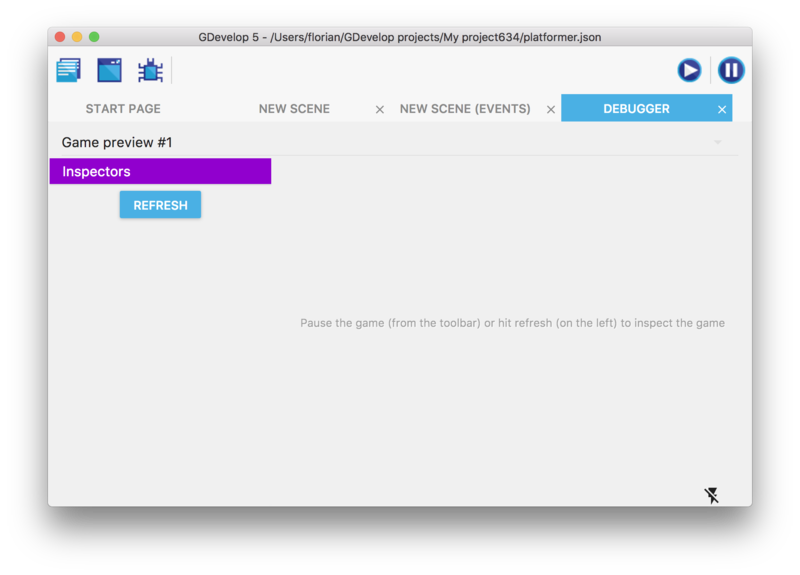 This will open a new tab called “Debugger” and will also launch a preview of your game as usual. Note that even if you close the preview, you can let the debugger tab opened. This way, any preview that you launch (with the usual Preview button) will be connected to the debugger. Click on “Refresh” at anytime to fetch the data of the game. You can also use the Pause button in the toolbar. If you click on a Scene name, you will display on the right the inspector for this scene. This inspector contains the layer of the scene and a button to create a new instance of an object on the scene. Validate your changes by clicking on the small validate button (the one with the tick icon). You can also see the variables of the instance and modify them (see below for more information about variables). 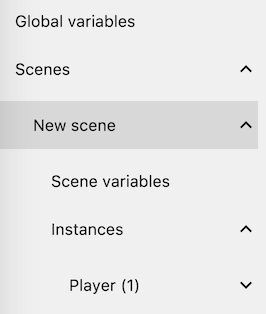 You can inspect variables of the game (global variables), of a scene (scene variables) or of a particular instance of an object (instance variables). To do this, in the list, click on Global Variables, Scene variables or the instance number that you want to inspect. As other fields, you can click on the value of the variable to change it. It's a good way to see how you game is behaving according to the value of variables and test that your events are working properly. You can also change the value of the children variables like any other. The profiler is a tool included in the Debugger that measures the time spent in various part of the engine while your game is running. It then show a breakdown of each section, including events. Read more about using the profiler here!